Food and wine pairings don’t have to be rocket science. An expert from Total Wine & More is sharing the tricks of the trade when it comes to choosing a bottle of wine that will work effortlessly with dinner. SAN ANTONIO — Food and wine pairings don’t have to be rocket science. An expert from Total Wine & More is sharing the tricks of the trade when it comes to choosing a bottle of wine that will work effortlessly with dinner. 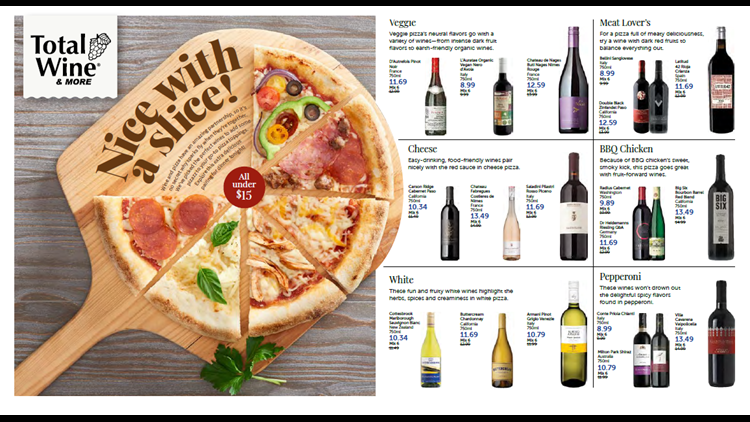 A selection of wines that compliment popular pizzas enhance the various toppings. “If you’re going to be doing a variety of pizzas with a variety of wines, much like with just the wine tasting, you want to start with least intrusive to the palate to the most intrusive to the palate,” said Wine Manager Eloy Gonzalez. For an Alfredo-based white pizza, Gonzalez recommends a Chardonnay. “Cream and butter and oak notes will complement the creamy style of pizza perfectly,” said Gonzalez as he poured a glass of Buttercream Chardonnay from California. Taste tester Paige Flinn approved of the pairing. Total Wine and More shares list of pizza and wine pairing recommendations. Moving on to the veggie pizza, our expert reaches for an organic wine. Up next is the BBQ chicken and a fruit-forward wine. “It's delicious. I think that both the pizza and the wine bring out the best in each other,” said Flinn. For Pepperoni Gonzalez says a spicy, acidic Italian wine like Villa Cavarena Valpolicella will do the trick. As for a slice of the classic cheese pizza, another selection nods to the pie’s roots. “With this we have our Rosso Picano from Saladini Pilastri. It is just a nice tangy sangiovese fruits, a good acidity to cut through the cheese and the fat and just these lovely bright fruit tones,” said Gonzalez. Each of the wines are priced under $15. Total Wine & More is also teaming up with Domino’s Pizza to offer a deal. 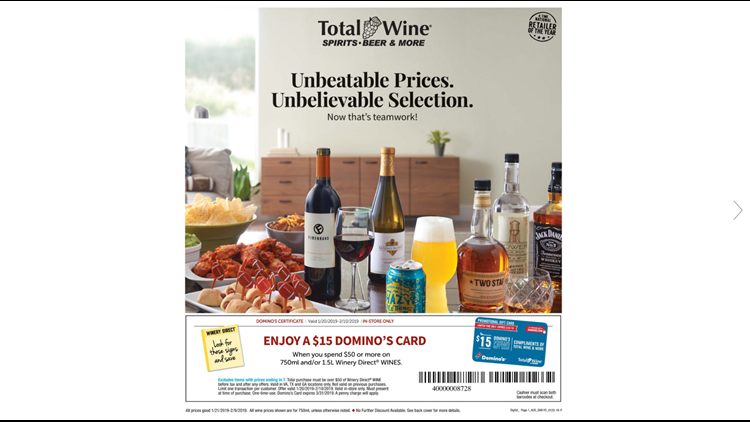 According to their ad, shoppers receive a $15 Domino’s card when they spend $50 or more on select sizes of Winery Direct Wines. Total Wine & More offers limited time offer. Staff in-store can help customers find the wine pairing recommendations and offer more details about the offer.